This is the story of what a woman's patience can endure, and what a man's resolution can achieve. I have always held the old-fashioned opinion that the primary object of work of fiction should be to tell a story. The best men are not consistent in good—why should the worst men be consistent in evil? Some of us rush through life and some of us saunter through life. Mrs. Vesey sat through life. Marian was the good angel of our lives—let Marian end our story. 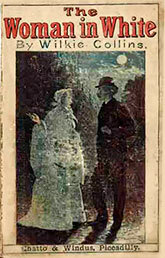 In the argument about whether The Woman in White or The Moonstone (1968) is Wilkie Collins's first great mystery novel, a compromise is often found. The Moonstone is given the mystery title, while the earlier Woman in White—which also features a mystery and a sleuth (albeit an amateur one)—is honoured as one of the first great sensation novels, or thrillers. This makes sense as it's one of the most heavily plotted novels you're ever likely to read. And it is sensational. There's the ghostly appearance of a mysterious woman, a secret society, a fortune to be inherited, an illegitimate birth, a flaming death, a fake marriage, switched identities, foreign agents, paranoia, bribery, blackmail, conspiracies—the twists and revelations keep coming. To tell the truth, as exciting and enticing as The Woman in White is, the endless plot contortions can become wearisome, especially near the end of the novel. What saves it though is the characters. These are not just stick figures going through their actions as in many a modern thriller. They're well-fleshed out characters whose fate actually care about, whether we like them or not. This may be his answer to critics that his work is mere melodrama, that it appeals overly to the emotions at the expense of serious characterization. His figures' personalities come from how they behave in the narrative. They may not be as quickly drawn as, say, most of Charles Dickens's memorable characters, but the best of them come through the fire revealing depths that may have been hidden at first. In a novel full of colourful heroes, villains and figures of mystery, one of the most interesting characters is the initially nondescript older, spinster sister Marian who selflessly comes to the aid of the central romantic couple. Collins is especially brilliant at dialogue in The Woman in White, each speech delivered in exactly the right voice—and contributing to the narrative. I don't know if any writer before this has so creatively and successfully used multiple narrators. Nothing seems forced. Each narrator is introduced naturally. Each has a naturally occurring reason for presenting part of the account from their perspective. It's appreciated that Collins, like other old-time authors, feels compelled to conclude all his tale's many threads. I really hate the modernist trend to end the story suddenly with loose ends hanging all over the place. However, I'm not crazy about the extended revelations and plot points at the end of this novel about a secret society's activities and all the details of a certain character's conspiring. They seem to take the novel in a new direction very late in the story—and away from the personal concerns of the characters we've grown attached to. It comes across as Collins trying at the end to give greater gravity to what he fears might be perceived as a superficial melodrama. Unnecessarily. I also object to The Prince and the Pauper syndrome that runs through so much Victorian literature. Why is is it so important to reveal that a hero who was resigned to being an honest and happy commoner is really—what a winderful surprise!—an aristocrat, the rightful inheritor of great wealth. Strangely, it seems authors concerned with reform and social justice are most susceptible to the appeal of this twist. As if a character's victory in finding love, truth and justice were not enough, but one must also have blue blood. But that's a complaint that applies to only a small part of The Woman in White and probably has more to do with writers having to please the readers of their time. Just like those long-standing and equally unrealistic literary shibboleths of evil-doers being vanquished, crime never paying, and love overcoming all. For Collins, as for Dickens and others, it's all about winning the engagement of readers with their characters. And The Woman in White does that in spades.